The Circle itself is a representation of Life. As such, those who are Keepers of the Circle support that which advances life. The Circle of Life is made up of Rings, each of which covers a different aspect of Life. Every member of the Circle is known as a Keeper, whether you are a basic member, the leader of a Ring, or the Sentinel. All are important and all are necessary to keep and maintain The Circle. Our goal is to maximize freedom of choice while respecting the Non-Aggression Principle. No member of the Keepers of the Circle is warranted to aggress against an individual (where aggression is the initiation of force, the threat of force, or fraud). This does not mean that you cannot defend yourself, others or property. Protection of life and property that is your own or anothers' is permitted and encouraged by many Keepers. 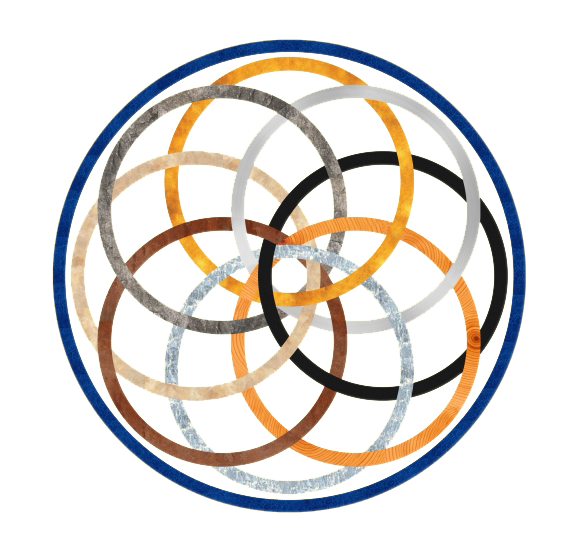 Each of the Rings of the Circle is interlocked with the others, with the Circle itself weaving through them. The symbol of the Keepers is eight interlocking rings being encompassed by the larger Circle. The Keepers of the Circle are a society of individuals who seek to improve life for all while maintaining individual rights and life as the highest values. We encourage advancement in all areas and hope to grow a community of people. All are welcome in our ranks so long as these goals are respected. The militant arm of the Circle, the Ring of Steel has the purview of Conflict. Conflict is an integral part of life, and the members of the Ring of Steel are those dedicated to the martial aspects of war. Members of the Ring of Steel are called upon in times of war to protect the other Rings as well as to honor martial contracts on behalf of the Circle (guard duty, aid in war, etc). The Healing arm of the Circle, the Ring of Light has the purview of Aid. Aiding those who need it is a principle that advances life. HOWEVER, this does not incur a mandate for members of the Ring of the Light to help anyone at any time; they retain their right to choose who and how to aid. Members of the Ring of Light willfully provide healing and mediation in time of conflict to both the Keepers of the Circle and her allies. are called upon to enact retribution against single targets, to disrupt supply lines of forces hostile to Life, and to reclaim objects that have been taken from their rightful owners amongst other things. The Ring of Wood is home to the Protectors of the Wild and holds purview over the uncultivated and untamed lands of our world. Though considered uncivilized by some, we know the true beauty of nature as well as the inherent dangers therein. We hunt and gather food and herbs, lead hostile creatures away, scout the unknown and safely guide travelers for the Circle. Through this we act as the first line of defense between the Circle and the rest of the natural world. The Ring of Crystal houses the Lorekeepers of the Circle and holds purview over the esoteric secrets and ancient mysteries of our world. From the masters of arcane magical energies to the humble scholars, we provide the Circle with a repository of knowledge and mystical power to draw upon in times of need. As a member of the Ring of Crystal, we study the past to prepare for our future. For life to thrive, there must be a solid foundation. The purview of the Ring of Earth is construction, farming and the gathering of all other natural resources that is done on a larger scale. The Ring of Earth forms the solid basis upon which the life of all Keepers of the Circle resides, providing food, shelter, and sundry other mundane - but no less necessary - services. The Ring of Earth is well respected for the infrastructure and power that they create and maintain, forming the structure upon which other Keepers of the Circle rely. The Ring of Earth also stores, distributes and sells raw materials. The individual rights of all sentient beings are sacred to the Keepers of the Circle. Fundamentally contracts show respect for those rights. Members of the Ring of Gold engage in mercantile transactions on behalf of the Keepers and serve as the diplomatic arm of the Circle maintaining positive relations with other groups and nations. Members of the Ring of Gold strictly adhere to their contracts as a matter of personal integrity. They are known for their hospitality to all, whether friend, foe or stranger. equipment, tools, and advanced items in conjunction with the other Rings, and to maintain the Circle's inventory and logistics.